In this 4th book of the Dublin Murder Squad the featured detective is Mick “Scorcher” Kennedy who takes on a bright rookie partner named Richie. One nice thing about French’s series is that the books don’t have to be read in order because they each feature different detectives on the same squad. It is usually one who was glimpsed in the prior book but that doesn’t seem to be important to the story line. In Broken Harbor a murder is reported to the Dublin police from a nearby community called Broken Harbor. When the detectives get there they find a half -built, half completely abandoned housing development – only a few of the houses are actually lived in. But in that development is an immaculate little house, looks like the perfect little suburban home, but it has 3 dead people inside, a family, the father, daughter and son of the Spain family – the mother has been very severely injured. A sister shows up quickly, she’d come because she’d missed the mom’s phone call and come to check. It was she who phoned the police. 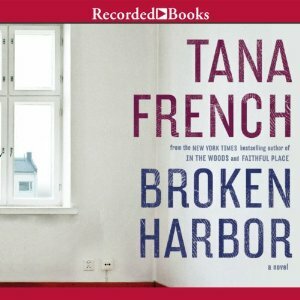 Yes, Broken Harbor is long – close to 500 pages (20 hours of listening) and there seems to be the usual extra material in there – Mick is divorced so he has an ex-wife, but what he really has on his hands is an emotionally disturbed adult sister he has care for from time to time. Mick is a huge control freak whose situation is intensely stressful. On the other hand his rookie partner Richie is bright and confident and although he’s young, he does well and the two become good working partners . But they are opposites in some ways – Mick knows the ropes, but Richie is far better with people and doesn’t jump to his own conclusions, isn’t adamant about them. He thinks, he feels, he has a great “bedside manner.” Between the two of them there develops a complex relationship – the result of two cops under severe stress, really. And the tension builds and builds and builds while my midnight oil burned and burned.